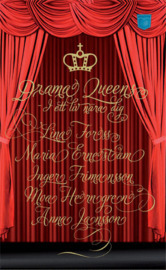 Drama Queens is a collection of exciting, stand alone stories about life’s drama. The stories are written by five of the best female Swedish authors, known to write exciting, engaging and emotional. Now their pens meet for the first time in the same book. It is about birth, death, love, work, unfaithfulness, everyday life, friendship and hostility. It is big, it is small, and it is everything. The greatest mother on earth. Can she really loose the right to her child? Good neighbors are wonderful … or? Online dating – pathetic or the way to happiness? Who are the man and the boy with the backpack and why on earth are they out bicycling in the middle of the night? Found: Small woman with big desire. The stories are short novels without any given rules, just like in real ife. Drama Queens is a strike for free storytelling and genre mixture, and the book, which is published in original paper back and audio book, creates a mutual reading experience for many readers.